The Nineteenth Judicial District Commission on Judicial Performance recommends by a vote of 9-0 (one commissioner being absent) that Judge Charles S. Unfug BE RETAINED. 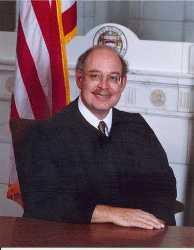 Judge Unfug was appointed to the Weld County Court on January 3, 2002. Prior to that, he was a District Court Magistrate for five years. Judge Unfug graduated from Cornell University Law School in 1977. He was a lawyer in private practice for 20 years before being appointed as a magistrate in 1998. He is a member of the Weld County Bar Association and the Byron White Inn of Court. One of the goals of the Inn of Court is to promote ethical behavior and civility among lawyers. Judge Unfug believes that such behavior promotes public confidence in our legal system. In addition, Judge Unfug has been a member of Lions Clubs International for more than 35 years, and a member of the Greeley Elks Club for more than 20 years. Judge Unfug believes his membership in these community service clubs keeps him in touch with the everyday citizens of Weld County and reminds him that his judicial role is to act for the public interest of these citizens. The Commission conducted a personal interview with Judge Unfug, reviewed opinions he authored, observed him in court, and reviewed surveys completed by attorneys and non-attorneys. Among the survey questions was “how strongly do you recommend that Judge Unfug be retained or not retained?” Of the attorneys responding to the survey, 72% recommended to retain, 16% recommended not to retain, and 12% made no recommendation. Of the non-attorneys responding to the survey, 85% recommended to retain, 9% recommended not to retain, and 6% made no recommendation. (These percentages may not total 100% due to rounding).